Now that didn't take long. Yamaha's do-everything RX-Z9 home theatre receiver has just fallen in price here in Australia, from $AUS11,999 to $9,999. Perhaps the strong Australian dollar has something to do with it. Or is it getting cheaper overseas as well? Anyone out there want to let me know? As a regular visitor to avsforum (US), avforum (UK) and beisammen.de (Germany) I think I would have heard something about a price drop. Also checked the Yamaha websites and the RRPs are still the same. It's clearly a case of mis-marketing here in Australia (what were they thinking!) and even A$10.000 is still way too much. The prices in square brackets on that list are the approximate values in Australian dollars, inserted by me. Hmm, I think Tom has a point. While many hate pan and scan presentations of widescreen movies on DVD, I am convinced that the worst possible way of presenting a widescreen movie is in non-anamorphic letterboxed format. The best way -- and the way the great majority of movies are presented -- is in anamorphic widescreen. I shall not buy Titanic until an anamorphic version becomes available. Consider the Region 4 PAL version of The Great Escape, one of the greatest movies of all time (according to IMDB.com, voted number 70). The version I obtained in late 1999 is presented in letterboxed (ie. non-anamorphic widescreen). The aspect ratio is nominally 2.35:1. Because it is non-anamorphic, the vertical resolution of this DVD is just 322 pixels (I measured this from a screen capture, the presented aspect ratio is actually 2.38:1). If the movie were in anamorphic widescreen instead of letterboxed, you would get 430 pixels of vertical resolution. So this disc delivers just 75% of the possible resolution. In order to overcome the resulting fuzziness, the picture at points has been over-sharpened to produce horribly distracting artifacts. Now this disc was an MGM one, distrubuted in Australia under an arrangement MGM then had with Warner Home Video. Since then MGM has set up its own distribution arrangements for DVDs in Australia, under the name MGM Home Entertainment Pty Ltd. And has released The Great Escape at the budget price of $14.95 -- or at least that's how much I've just paid for it the local supermarket. Now why would I buy a DVD that I already have? For better picture quality of course. I am all too aware how DVDs are sometimes mislabelled, particularly with regard to aspect ratio and running time. So I inspected this DVD's cover very carefully indeed. As you can see, the information box for this DVD is more wrong than right. For example, the time of the movie is shown as 172 minutes, when it is actually 165 minutes (PAL movies run 4% faster than the original theatrical presentation). The aspect ratio is shown by the icon at bottom left and the text to its right as 1.85:1, when it is nominally 2.35:1. But I focused mostly on the next marking to the right: '16:9'. This is shorthand for 16:9 enhanced (or anamorphic). Whereas 4:3 is used for non-enhanced. So I was very hopeful. The fact that the same 24 minute documentary was on this version as my previous one made me worry a bit. But then my eye lit on the 'Language' box: 'English 5.1'. The old version is definitely mono, presented in Dolby Digital 2.0. So, I thought, maybe they have remastered it after all! I plonked down my money. But it turns out that both the '16:9' -- it is a 4:3 transfer -- and the 'English 5.1' are totally wrong. Let's recap: the run time is wrong, the aspect ratio is wrong, the formatting (anamorphic or not) is wrong, and the audio standard is wrong. Not a bad effort, eh? In fact, the DVD contained within the box is identical to the 1999 version in every way, other than the label. It is identical in organisation, amount of data (7,292,649,472 bytes) and logical disc label (56680D4). I shall try to establish contact with MGM Home Entertainment Pty Ltd tomorrow and see what they're going to do about it. Not just my copy, but all the DVDs they've distributed with misleading or false information on their covers. I was also contemplating buying A Fish Called Wanda for the same reasons (the new version also says '16:9' on its cover), but now I'm glad I didn't. The Great Escape (2002 release) is reviewed on Michaeldvd (and three other sites) as 16:9 enhanced & 5.1 encoded. A Fish called Wanda SE is definitely 16:9 enhanced, I just checked my disc. I would expect the single disc version to be the same. One disc I know of where the 16:9 is definitely incorrect is The Abyss. The original 2 disc version says Widescreen Version 16:9 and is letterboxed, the single disc rerelease says only 16:9 and is, again, the same disc in letterbox. With this one I made the same mistake you did! Bummer. Unlike Tom, I would expect the single disc version of A Fish Called Wanda to be like my old copy. The information on the back cover on The Great Escape was presumably messed up through confusion with the standards of the SE version. Chances are this was also done with Wanda. David Friedman, a scholar in law and economics, has published several fascinating books over the years including one of my favourites: The Machinery of Freedom. His latest (next?) book, Future Imperfect, is available on the Web in draft form, complete with provision for making comments. My tenuous excuse for mentioning it here is because it does deal with issues of future copyright enforcement. But, less relevantly, I was struck by this superb example of economist-think. An example of how counter-intuitive -- but equally how right -- much economic thinking can be. The STAR WARS TRILOGY tops the list of 'cinephiles' most-requested titles never released on the format,' according to a May 2003 E! Online report. 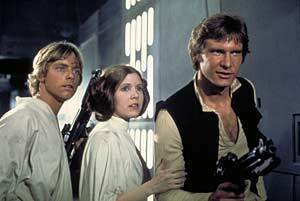 Further, the three STAR WARS TRILOGY films � Star Wars: A New Hope, The Empire Strikes Back and Return of the Jedi -- also hold the top three spots on Amazon.com's 'most-requested DVDs' list. Star Wars Episode IV: A New Hope, Episode V: The Empire Strikes Back and Episode VI: Return of the Jedi will be available in a four-disc set that includes a bonus disc filled with all-new special features -- including the most comprehensive feature-length documentary ever produced about the Star Wars saga and never-before-seen footage from the making of all three films. Each of the three films in the STAR WARS TRILOGY has been digitally restored and re-mastered by THX for superior sound and picture quality. The films of the STAR WARS TRILOGY will be available exclusively as a collection and all three films will be closed-captioned. Personally I don't think that it will recapture the feeling I had in the opening minutes of the first time I saw the original Star Wars in late 1977. But that's only because I now expect what was then a surprise: surround sound. The opening shot of that huge space ship coming from behind me, over my head, accompanied by real Dolby Stereo surround sound, was quite amazing. As for the rest of the movie: seeing space shots done well for, seemingly, the first time since 2001 was great too, even though I was never especially enamoured of the story itself. Note that last paragraph in the quoted section: if you want just the original Star Wars, you're out of luck. You'll only get the boxed set. One thing I'd like to see, although I doubt that it's likely, is the original version of the movie without the later digital effects added. What can I say? Sorry. But now the kids are back at school so I'll try to be a bit more regular here. For those interested in the evolution of audio systems used in cinemas, have a look at Nick's Auditorium, a Belgian site in English, which has some fine explanations of the various audio standards, including a few that have bit the dust along the way. It also suggests that Star Wars was indeed not the first Dolby Stereo movie. It claims this for Lisztomania (albeit without any use of the surround channel), and in full-blown surround the site claims A Star is Born (the Streisand, not the Garland, version of course). A few posts ago I mentioned the Sydney-developed DEQX speaker correction system. Now the famed Abbey Road Studios has installed three of the PDC-2.6 systems (each is stereo, so three provide six channels). The studios are apparently not availing themselves of the full capabilities of the system, but primarily using it to correct room-induced anomalies in the bass frequency response of their monitoring system. It's extraordinary what digital technology is allowing. It seems that Abbey Road considers this system as the ideal (and therefore 'high-end') solution to its needs. Yet a single PDC-2.6 is within the (somewhat extreme) realms of affordability to the high fidelity enthusiast. International Dynamics has drawn to my attention the DVI Gear Web site at which various DVI cables may be bought. Better yet, follow the 'Learn About DVI' link to find some excellent material (some quite technical) on DVI and HDCP.